Millions of people in Japan have ikigai, meaning a reason to jump out of bed each morning on purpose. Ikigai or reason for being has its origins on Okinawa the home to the largest population of centenarians in the world. The Big Q: Could the concept of ikigai contribute to a long life? The concept of ikigai is not exclusive to Okinawans, there are a few other places called ‘blue zones’ such as Sardinia and Nicoya Peninsula where that same concept exists among people who are living long lives. The Big A: Make a list of your values, things you like to do, and things you are good at. And within the lists lies your ikigai. 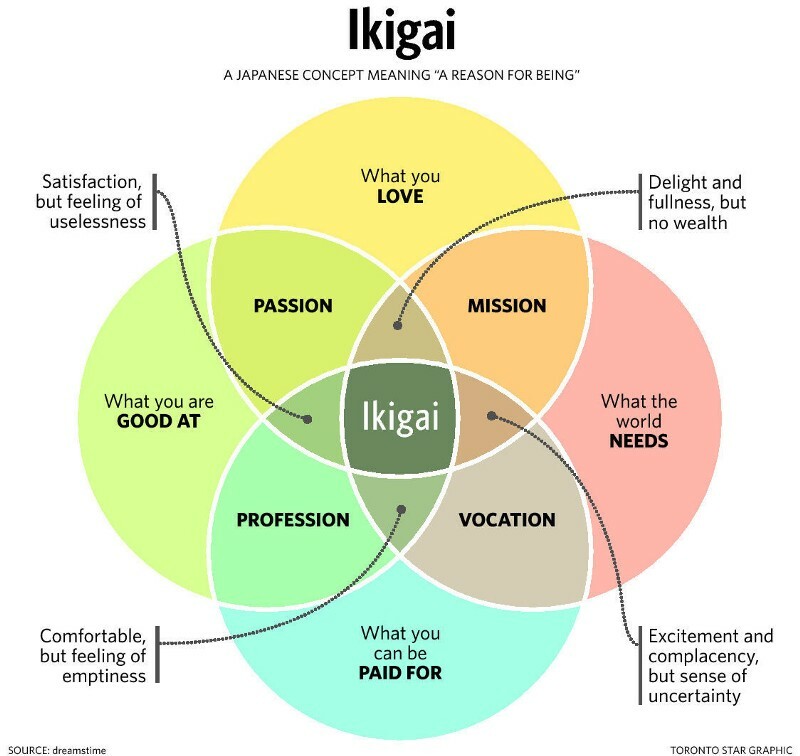 “Your ikigai is at the intersection of what you are good at and what you love doing,” says Hector Garcia, the co-author of Ikigai: The Japanese Secret to a Long and Happy Life. Discovering your own ikigai will bring fulfilment, happiness and make you live longer. What can I be paid for now, or something that could transform into my future livelyhood? In their book Ikigai The Japanese Secret to a Long and Happy Life, Hector Garcia and Francesc Miralles break down the 10 rules that can help anyone find their personal ikigai. Give thanks to anything that brightens the day and makes you feel alive. Live in the Eternal moment, the Now. Ask what makes you come alive and go do it, make it happen. The world needs is people who have come alive. Change that, looking for meaning and fulfillment in what you do every day. Albert Einstein encourages us to pursue our curiosities. Our insatiable drive to learn, invent, explore, and study deserves to have the same status as every other drive in our lives. Fulfillment is fast becoming the Key priority for most of us. Ask yourself this: What is the simple thing you could do or be today that would be an expression of your ikigai? Find it and pursue it with all you have, anything less is not worth your limited time on Earth.